Not a bento post, but this is something I’ve always wanted to post on my blog. “Oil hardening” products are very common in Japan. A couple different companies make them, but they’re pretty much the same thing. 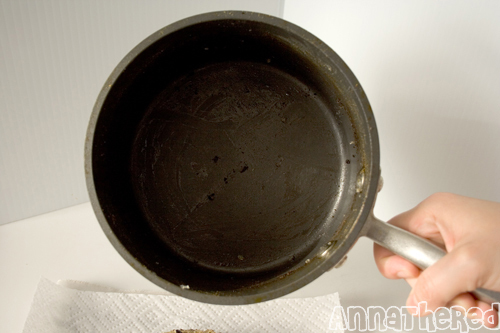 You put the oil hardening powder into hot oil, leave it until it cools down, and voila! Oil becomes solid so you can throw it away as regular trash! The powder is made with natural vegetable oil so it’s very environment friendly. When I came to the U.S. 15 years ago, I didn’t think the “oil hardener” was anything special. Whenever I had a large amount of oil to discard, I always looked for an oil hardener in a supermarket in the U.S. but I could never find one. So I looked for it online, but came up with nothing except the Japanese one I’m talking about. I was asking my boyfriend if he’s heard of something like that in the U.S., but he couldn’t think of one either. So I showed it to him one day, and he thought it was really cool. 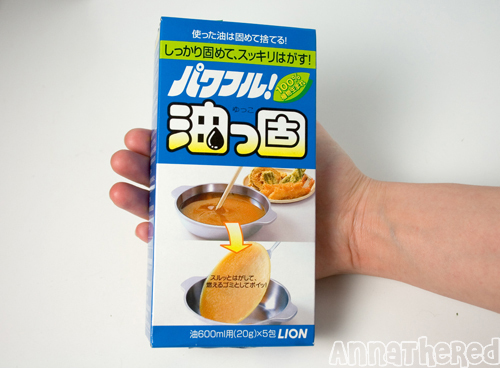 I had a large amount of rather old oil (I’ve been using it for frying croquettes), so I decided to take pictures of how this Japanese oil hardener works. The one I used is called "Yukko" by a company called Lion. It's about $5.50 and comes with 5 packets of oil hardening powder. 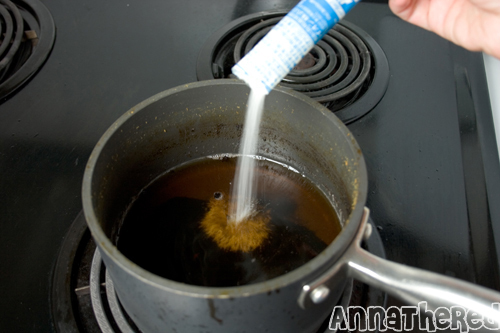 Right after you use the oil, pour the powder into hot oil and stir. The package suggests using one package (20g) of powder for 600 ml (about 20 ounce) of oil. The oil must be hot. I left it overnight. Ladies and gentlemen, the oil has been hardened. 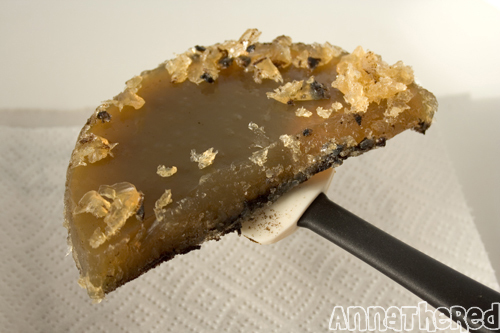 Scrape around the edge, and remove the oil with a chopstick or spatula. It’s actually easier to remove the oil from a frying pan or wok like the picture on the box, but I use a pot for deep frying. 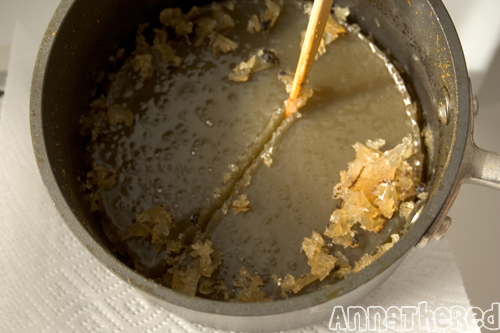 It looks messy here, but if you do this with a frying pan or wok, it's not as messy. 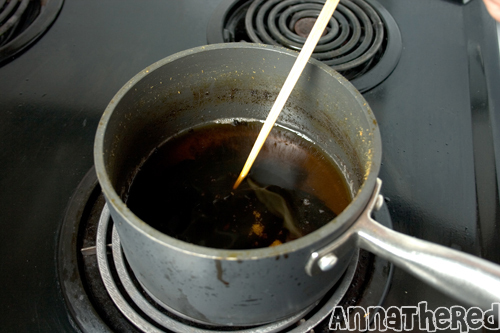 Once the oil is hardened, it doesn't melt, unless you try to melt it by putting it into heat. You can throw it out with regular trash. 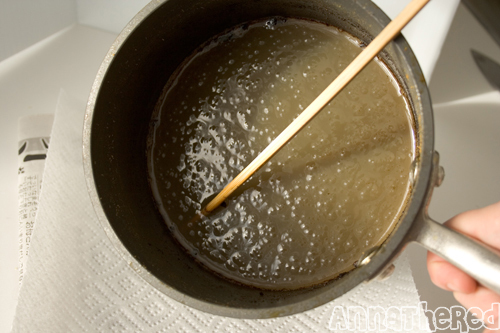 After scraping all the oil off from the pot. 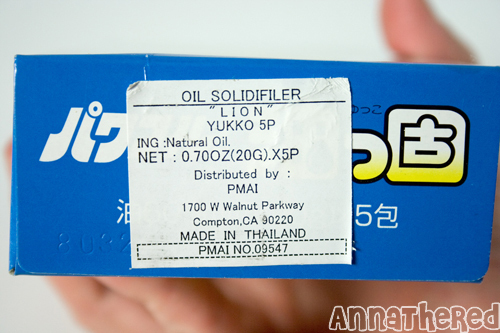 There are a couple of Japanese oil hardeners with different names (Yukko, Temple, etc…), but they’re pretty much the same. I buy it from a Japanese supermarket in NYC, so it’s not something you can get it at a local supermarket, but you can still buy it online.